Well we just move from one intense cliffhanger to another with this show. 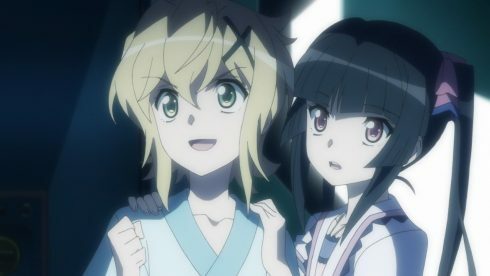 Now that’s the Symphogear I’m familiar with! It even came with the familiar situation of the show making you worry about something (Kirika’s swan song) only to make it not an issue in a hurry the following episode XD. Heck the rescue squad manages to safely grab Kirika before any fighting even breaks out between Hibiki, Saint Germain and Adam. And how about that damage she suffered? Apparently it wasn’t too bad as she manages to walk into the command room before the episode is over! Now to be fair…she was still in a medical garb. So maybe the fight actually took a really long time and they managed to treat her quickly. They’ve got an alchemist now and…maybe the overdose issues are easier to resolve now that they’ve had practice? But let’s see what they do with Kirika later. At this point the literal bigger issue is what is happening with Hibiki. So yeah….she’s turning into a god or something! But looking at that freakishly ominous cocoon…I’m not expecting this to turn out well. It’d be a kind of simple conclusion if Hibiki simply emerged from that as a peaceful deity and started making the world a better place. That would be a pretty hilarious option though for the story to go with. At least now we’ve got something for the main cast to do. The Hibiki and Saint Germain combo was basically cleaning house. At least they did actually come up with an explanation for Adam’s situation and why he doesn’t just nuke everyone. And it also explains why he even bothered with Saint Germain and company. He didn’t want to start anything and leave himself weakened if possible. So there’s a lot to take in with this situation. 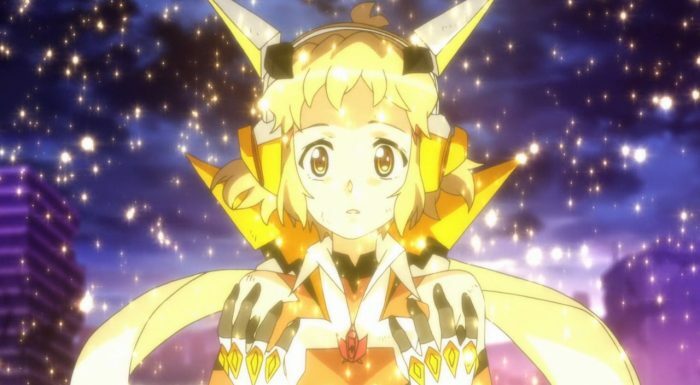 Hibiki absorbed the divine power and it is going to transform her. I’m guessing that similar to Tiki she’ll still be normal, but just trapped inside that thing. The bigger issue will likely be doing enough damage to yank Hibiki out of there. That could be a serious issue considering that Hibiki is the one using the god killing relic. And it isn’t like Adam is defeated….he’s still there. Saint Germain isn’t as big an issue since she’s at least a temporary ally. In the end though talk about stepping things up. 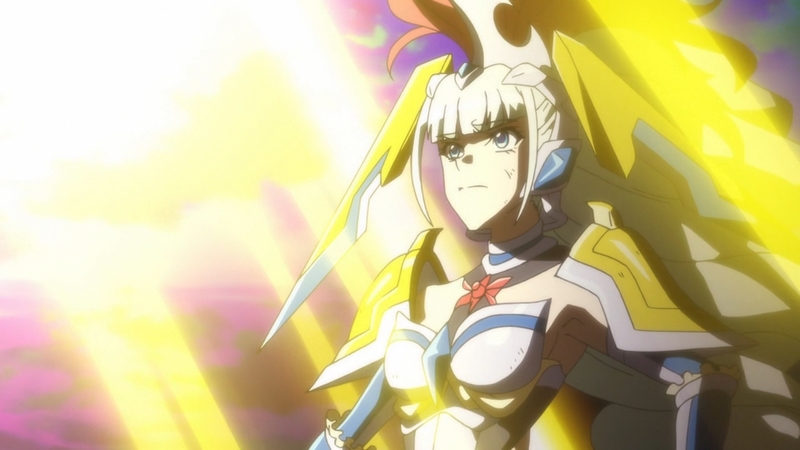 Season 2 was all about the crisis of Hibiki merging with Gungnir. Now she’s taking it a step further and merging with divine powers. I don’t want to be the one having to give Miku a call to explain all of this! And hey Adam is a robot! So…I didn’t see that one coming. It looks like he’s yet another remnant from the same period that Finé is from. In that sense it makes sense that his handling and reveal has been similar to Finé. He’s been lying and using people like Saint Germain for his own goals. And the truth about his origins and goals are only revealed in episode 11. Talk about long term enemies. Adam was a prototype made by the God that created the moon relic and whom Finé was obsessed with. I’m not sure if Adam is implying that humans were the more imperfect creation that were made after him or if there are more advanced robots out there made by these Gods. Regardless he is rather pissed off that he was thrown away for being “too perfect.” This guy is another crazy robot. 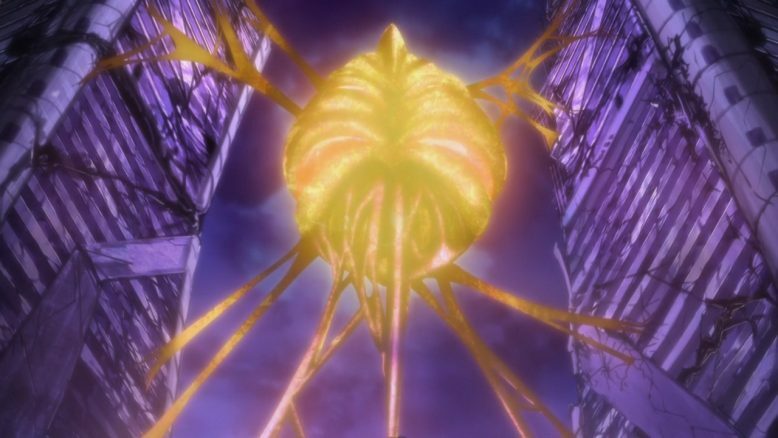 So in the end Gungnir was the god killing weapon. 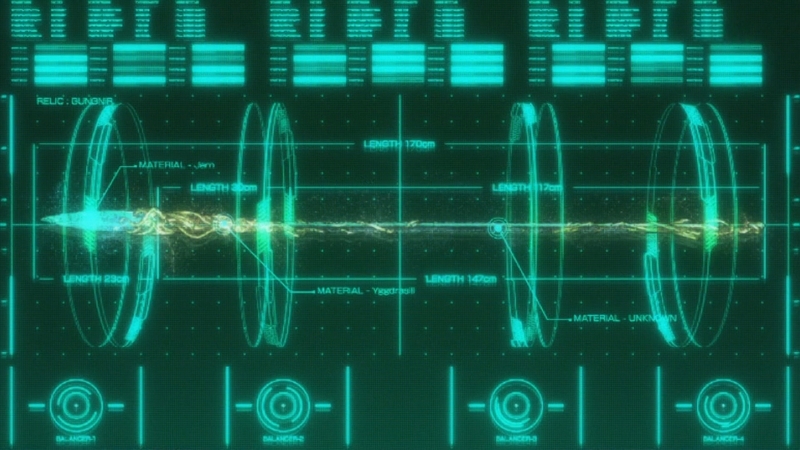 It also appears that they turned the Lance of Longinus into the Gungnir in this world’s history. Or they are simply saying that people misinterpreted the spear as being its own unique thing. That they simply gave the spear that pierced Jesus the name “Lance of Longinus” not knowing it was actually the Gungnir the whole time. Regardless that’s how they are making this work, by turning the Gungnir into an anti-god conceptual weapon. They are continuing to pull from different seasons. 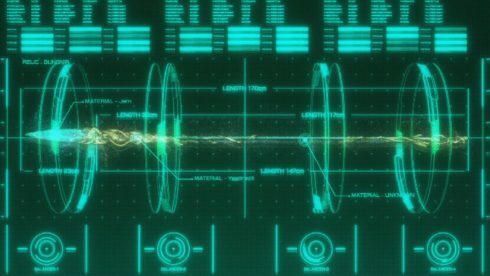 This time taking the conceptual weapons shown off in Season 3 (the anti-sword weapons) and bringing it back to play here. This season seems to be doing a lot of pulling from what has happened before. And that does allow for the history of the show to feel more concrete. While I thought it would be Hibiki struggling to fight while defending Kirika, it was Adam having the tough time. He had to not only fight off Hibiki and Saint Germain, but protect a pretty vulnerable Tiki at the same time. In a sense things didn’t get much easier for him when Tiki actually turned into that powerful monster since it just made her a massive target. If Hibiki wasn’t around that would be fine since she was basically immortal. But with a god killer on the loose it just made her someone to bring down. I also enjoyed the combat this time around. It was fun last week watching Hibiki and Kirika against Saint Germain. But it is also fun seeing how these two can combine their strengths against a specific enemy. Hibiki’s new song was pretty solid. I’m not sure it will be one of my favorites, but it worked just fine for this situation. 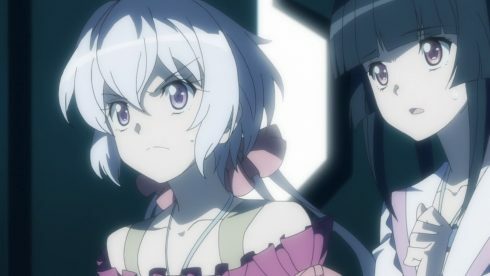 And it is very much like Hibiki to stand together with a former enemy during a crisis. But, wow she really has no mercy for artificial life XD. All sorts of issues with finishing off Saint Germain, but she was fine with annihilating Tiki. And now we’re really moving into the finale. Elfnein better be done with those gears soon since there really isn’t any time to waste here. They need to get down there and get Hibiki out of that thing before things turn messy. 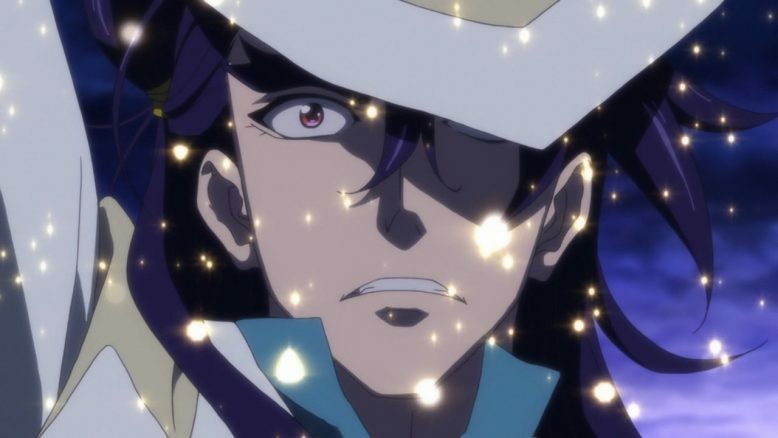 Who knows how that god power will influence Hibiki and what might happen. She’s a pure person, but she has a lot of baggage at the same time. If nothing else this isn’t going in the direction I expected and that is ok. We’ve got a pretty big cliffhanger with Hibiki now in some serious trouble. Do they have the tools to get her out of it? Is Miku actually going to get a call about this? I have no idea. But this should be pretty fun to keep an eye on.